Used at the Duck Lane plant for water requirements at the Jameson Distillery in Dublin. This fine Victorian gothic building, once stood near Inchicore Railway Works. In the Model Hall the Collection consists of Early Inventor's models, Scientific Engineering Models, and Historic Works of Mechanical Art. 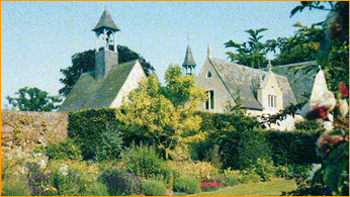 The 18th Century walled garden adjoining Lodge Park has been under restoration for the last few years and the old brick-faced walls are clothed with climbers, fruit trees and roses. 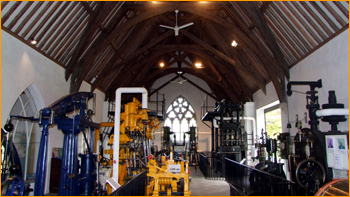 The Power Hall displays six huge nineteenth century Stationary Engines running in steam on occasions. 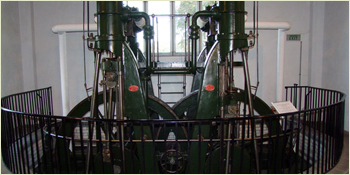 Demonstrations are included of steam powered electric lighting, and of equipment removed from a Dublin laundry driven through its original belt and line shafting to an early prime mover. A Cornish boiler and several small engines are on show. Portraits of the Great Inventor's and Engineer's of the Steam Age can be seen. The Halpin Collection has samples from the first transatlantic cable laid between Valencia Island and Newfoundland. The Entrance Shop sells items of steam and garden interest, and the Steaming Kettle Teahouse (Open Bank Holidays Only) can provide coffee/tea and a light lunch if booked in advance. A magnificent South facing shrub border edged in box hedges and topiaried yew trees runs the length of the garden. Beech hedges divide the different compartments into a white garden, salad parterre, coloured borders, decorative vegetable area, herbaceous border and a walk-way of sweet peas. The newly restored greenhouse contains an interesting collection of unusual plants from all over the world. Outside a small pond is surrounded by beds of colourful annuals. Nearby there is an area where plants are for sale. Another feature of the garden is the outstanding rosarie which is encountered on entering the orchard. The flowers and their scent are at their best during June and July, a heady experience not to be missed. Wander through the walled garden, with its magnificent North South reflecting border, and then visit the adjoining Steam Museum and Gift Shop to make for an enjoyable summers afternoon. Click the above map to view an enlarged version. Pre-booked groups are welcome for morning coffee, lunch or tea in the Steaming Kettle Tea House. If lunch is required please see Menus in the Steaming Kettle Teahouse info box to the right. Open on Bank Holidays only, the Steaming Kettle Teahouse (wheelchair access) is situated across the courtyard and provides attentive service and home made teas, lunch or dinner by arrangement.